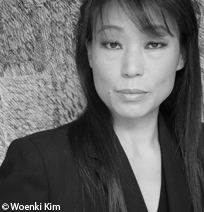 A Korean composer born July 14, 1961 in Seoul. A pianist by training, Unsuk Chin first studied composition at Seoul University with Sukhi Kang. A laureate of the Gaudeamus Prize in 1985 and holder of a bursary from the DAAD Program (Deutscher Akademischer AustauschDienst), she then took advanced classes in Hamburg with György Ligeti (1985-88) before settling in Berlin. In the course of her studies she developed a certain fascination for extra-European music, including the Balinese gamelan which was a notable inspiration for the composition of her Violin Concerto (2001). Liberated from all aesthetic diktats, her works performed in many countries, Unsuk Chin has developed a personal language, with textures at once dense and clear, and highly sophisticated instrumental and vocal writing (Akrostichon-Wotspiel for soprano and ensemble, 1993). Her music, thoroughly imbued with shimmering, dreamlike instrumental colours, reveals a predilection for the voice, in particular the female voice (Die Troerinnen for three female singers, female chorus and orchestra, 1986; Alice in Wonderland, opera, 2007), as well as for virtuosity (Double Concerto for piano, percussion and ensemble, 2002). Les partitions de Unsuk Chin sont éditées par Boosey & Hawkes. KÖNIGSDORF Jörg. Mécanique de l’imaginaire : entretien avec Unsuk Chin. Accents, 2009, no 37, p. 13.